Washing your hair is obviously important. It helps you strip your strands from all the dirt and oil that has built up over the day (or week for those who choose not to regularly wash it for a variety of reasons). Regardless of when you wash your hair, you should consider what you are washing your hair with. Some women believe that you get what you pay for and spend an arm and a leg on high end shampoos. Others want to take the organic route and try to concoct their own out of household ingredients. If choosing the latter, are there really certain ingredients that can cleanse your hair just as well as a bottle of manufactured shampoo? Read on to decide. If you want to pass on the shampoo, give baking soda a try. It is said to work wonders on hair and it’s known for its clarifying properties. Mix a tablespoon into one cup of water, or adjust to your liking. 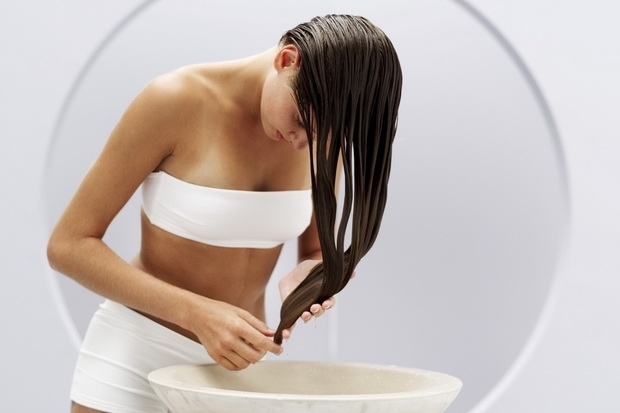 Soak your hair as usual before you wash, and massage it into your scalp. You will notice that your hair is stripped from dirt, oil, and product build up instantly! Many believe that their hair feels lighter, healthier, and even has less frizz and static. Apple cider vinegar is getting a lot of recognition lately because of all of its health benefits. Who would have thought it could be a shampoo too? Since it is acidic, it detangles hair follicles and restores the natural pH balance in your hair. Simply add a tablespoon to a cup of water and rub it into your roots. Wash it out with warm water and your hair will look and feel refreshed! Not only an ingredient for your smoothies; coconut milk has been said to be an amazing natural cleanser for dry, damaged hair. Wash your hair as normal and pout a quarter sized amount into your palm. Massage the milk onto your hair and add more as you need it. Rinse it with warm water and your hair will feel clean, soft, and even shine! Doubtful about these natural cleansers? Well, they certainly aren’t for everyone. Give it a try or have a conversation with your favorite hair stylist New York to determine the effectiveness of these natural shampoos!